Alimed Small Clear Plate Guard by AliMed at Bijc. MPN: 8131. Hurry! Limited time offer. Offer valid only while supplies last. Plate GuardsDishwasher safe. Small fits dessert plates. Plate GuardsDishwasher safe. 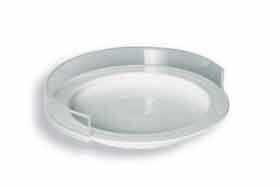 Small fits dessert plates. Clear.